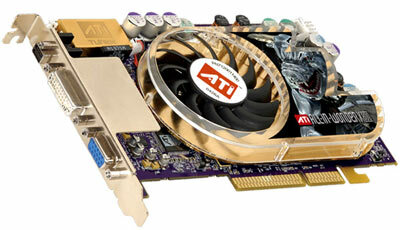 As suggested by the name, this will be ATI\'s premium All-In-Wonder product, based on the X800 XT graphics processor. The board will be clocked at 500/1000 - these are the same clocks that can be found on the X800 XT PCI-Express based graphics board. There has not been an AGP-based X800 XT announced despite them appearing on the market. Initially, the All-In-Wonder X800 XT will only be available as an AGP part. With the board being based around the X800 XT graphics processor, the board will feature 16 high-speed pixel pipelines, 6 vertex shaders, Pixel Shader 2.0b and Vertex Shader 2.0 support. The All-In-Wonder X800 XT features all of the elements that are normally associate with the All-In-Wonder series of graphics boards. These include TV and FM radio tuners; the latter was introduced on the All-In-Wonder 9600 PRO. There\'s also ATI\'s MultiMedia Center software suite, which includes a comprehensive set of features. Dependant on which board partner you choose to purchase the All-In-Wonder X800 XT from, you will have a choice of remote control configuration - there\'s the option of Remote Wonder, the recently released Remote Wonder II, or no remote at all. We will discuss the advantages of Remote Wonder II in an upcoming review. It is the first All-In-Wonder board to feature DVI and VGA connectors along with a TV and FM Radio tuner in a single slot device. The new, smaller Input/Output port makes this possible; this port moves all multimedia connections away from the back of the board. This led to a redesign of the input and output functionality. This is the first video card to feature ATI\'s newly designed input and output block connectors. 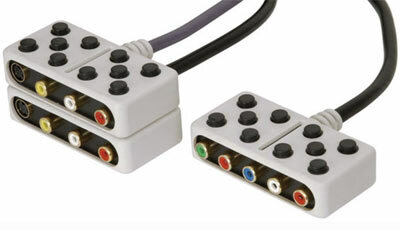 These blocks are completely stackable; the new I/O leads also add full support for RGB SCART, something that has been one of the few things missing from the comprehensive All-In-Wonder input/output array. ATI have made some changes to the multimedia components on the board too. The Phillips tuner has been replaced with an on-board ATI tuner - this has greatly reduced the space taken up by the multimedia features on the board, which subsequently allows for a bigger heatsink/fan combination. We can expect to take a look at an All-In-Wonder X800 XT in more detail over the coming weeks.